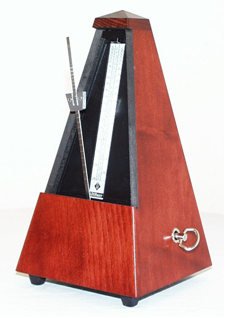 Since you’re serious about improving your playing why not try using a metronome? If you’ve not used one before you could be in for a pleasant surprise. As everyone knows, a metronome helps to develop a good sense of timing, and even if this were the only benefit it would be well worthwhile – but there’s more. It makes practise more effective. It develops your sense of timing. It shows up other weaknesses. It trains you to keep going. For example, effective practise involves focussing on the weakest bits, but relying on your music teacher to tell you which they are is an expensive luxury. Instead, just play along with a metronome, and then work at the bits where the timing slips. This way you’ll pick up on slight hesitations that you might otherwise miss or pretend to yourself you didn’t hear. Another luxury you can’t afford, especially when performing or in a band, is hesitation after a fluffed note or other error. So, just turn on your metronome, which is now your personal audience/band substitute, and practice not missing a beat. 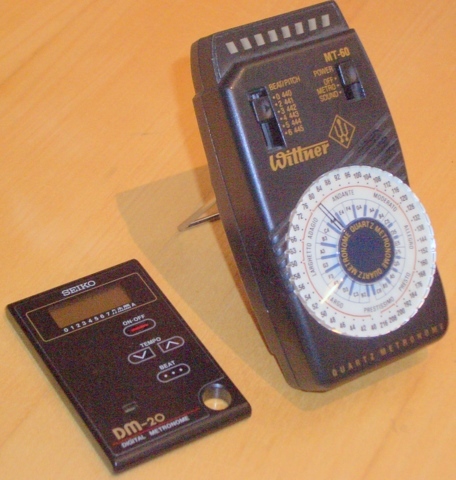 Mälzel’s Metronome dates from 1816 and is still in production virtually unchanged (see picture). It is a brilliantly effective ‘audio-visual aid’ which has amply stood the test of time. An inverted pendulum controls a clockwork mechanism and as it swings it beats time, with a loud click at each reversal. You just slide a weight up or down the pendulum to vary the beat rate from 40 to 208 beats per minute. 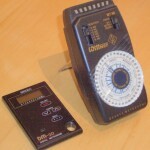 Needless to say there are plenty of electronic alternatives to the mechanical metronome, like the two shown in the picture here. Also anyone with a smart phone already has a metronome once they load a suitable app onto it. In my opinion though, Mälzel’s low-tech mechanical device wins hands-down over the hi-tech competition. Not only is it a living antique which, just like the accordion, operates on muscle power, but while practising you can reflect on what good company you keep – because Beethoven himself had one! He pioneered ‘MM’ time markings in 1817, the year he began his ninth symphony.